This project forms part of the 7,000 m² of the sports area of the University of the Atlántico. 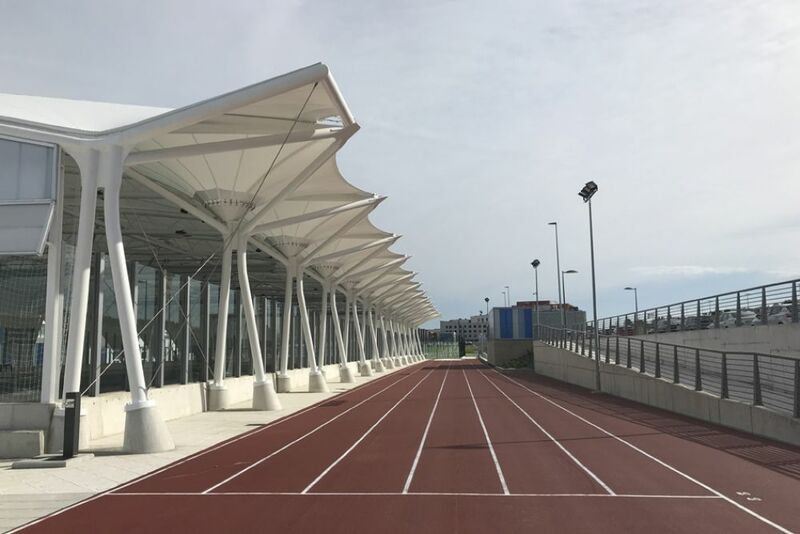 The complex has a series of open-air installations and others indoors for practice by students in the Physical Activity and Sports Sciences course. 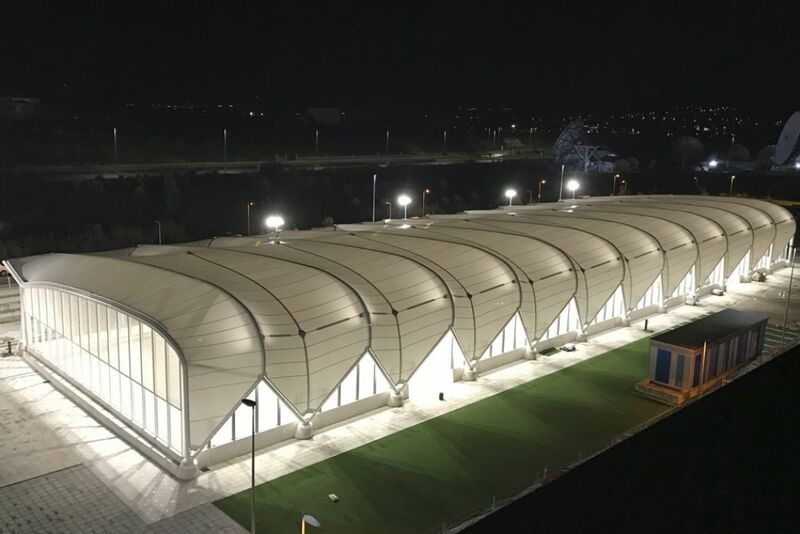 The textile structure, which covers a large part of the sports complex, is a touchstone architectural element within the Science and Technology Park of Cantabria (Pctcan). 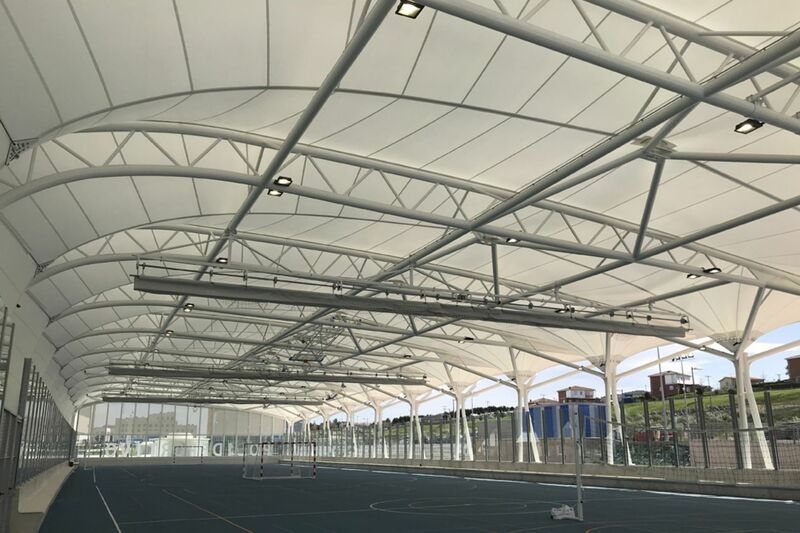 The originality that characterizes its design will enable the students to fully enjoy natural light, but protected from inclement weather. 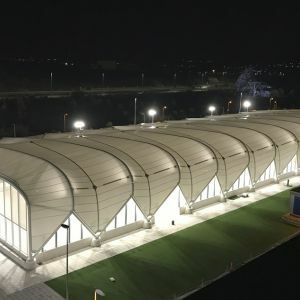 The covering is a metal structure with a slightly trapezoidal floor plan, with total measurements of 90mx30m and a maximum height of 9m. The construction is composed of 12 central lattices and a wall on each end. 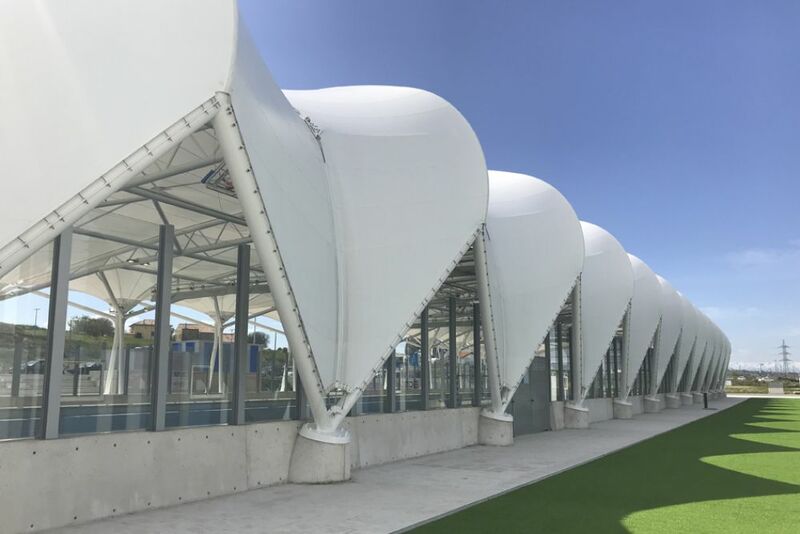 The structure is supported on 39 reinforced concrete bases that transmit the loads to the pillars of the underground parking lot, over which the textile covering is located. 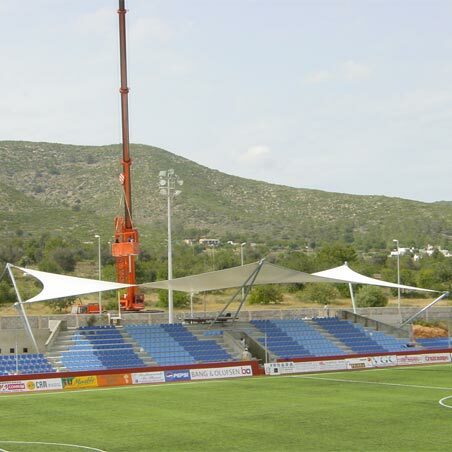 The steel structure is built with tubular profiles with joints welded on site. 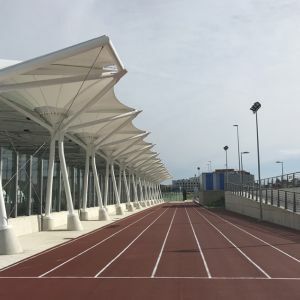 The porticos at the front are connected to steel beams and stainless steel staying bars. 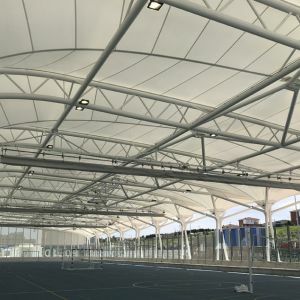 The roof consists of 13 tensioned canvas sections fixed independently to the steel structure by an aluminium profile and skirts between them to guarantee water tightness. 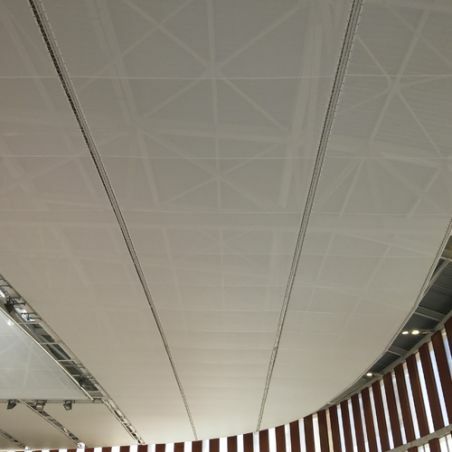 The membrane used for the roof is Ferrari TX30-III textile with a true magnitude area of 3,170 m². Stainless steel cables were also added to reinforce the membrane. 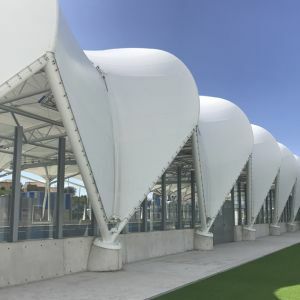 Each roof membrane has a gutter to collect rain water, connected to downpipes inside the pillars in the structure. There is also a permeable side covering at the eastern front with Ferrari FT381 grille type textile that covers a side area of 28.3 x 3.8m at its highest point and 1.9 m at its lowest point. 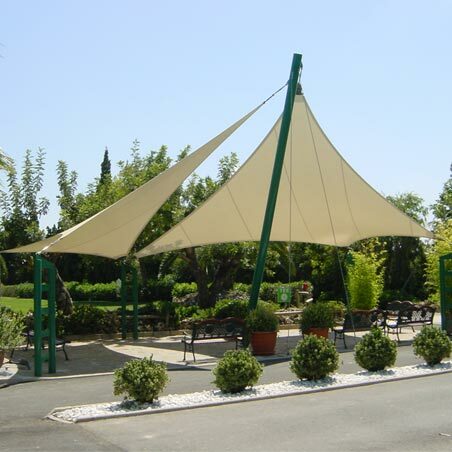 The enclosure consists of 16 tensioned canvas sections with a total area of 74 m². 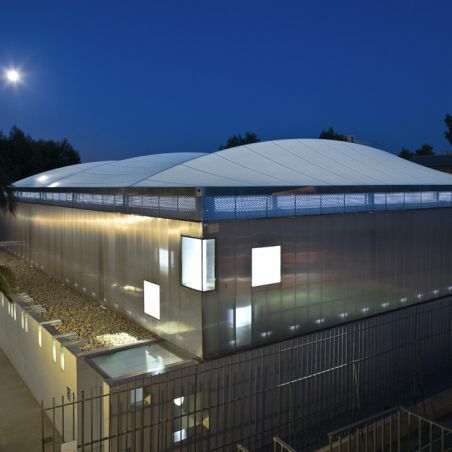 The membranes are anchored independently to the structure with an aluminium profile throughout the perimeter.